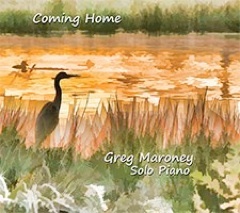 Coming Home is the twelfth album from pianist/composer Greg Maroney, one of my all-time favorite artists. Maroney released his first album, Songs of the Water Rose, in 1997, and although that is a great album, his artistry has grown and matured over the years. Equally comfortable composing a tender love song or a turbulent piece about a wild and dramatic storm, Maroney’s albums are truly a glimpse into his life, world and heart. A trauma nurse as well as the owner of a small farm in rural Pennsylvania with his beloved wife, Linda, Maroney has a wide variety of inspirations to draw from and expresses them vividly and beautifully. 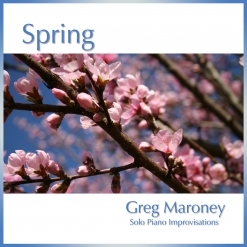 Coming Home is a collection of fifteen piano solos, all of which are original except Maroney’s gorgeous arrangement of “Shenandoah.” As usual, there is a colorful variety of moods, from sweetly romantic to sadly reflective to playful and energetic. Coming Home is very likely to be on my list of Favorites for the year! Coming Home begins with “Gentle Dawn,” a classically-styled piece that is as soft and dreamy as daybreak - welcoming and optimistic. “The Heart is Enough” overflows with feelings of contentment and peace. The freedom and spontaneity of the music suggests that this one might be improvised - beautiful! “After the Storm” is one of my favorites. Graceful, dramatic, and darkly powerful, I can’t wait for the sheet music for this one! The title track is a gentle ballad that expresses anticipation as well as a deep happiness. “Dreams” is another favorite with its day-dream blissfulness and passionate flow. Maroney uses his impressive playing chops to full effect on this one! Love it!!! “Spinning” playfully dances around the piano keyboard, fast and fun! I also love the deeply emotional and expressive “When It’s Gone.” Sometimes quiet and reflective and sometimes stronger and more complex, it says so much. “Honeysuckle” returns to simplicity and an appreciation for the small things in life. “Linda’s Smile” is a tender love song that will touch even the most jaded heart - another favorite. “The Cat and the Cricket” is in a similar style to Maroney’s earlier “Dancing Dogs” and “The Chicken Chase” - high energy and fun, and again thoroughly enjoying one of life’s simpler moments. The wistful melody of “Shenandoah” has made it one of my favorite American folk songs for most of my life, and Maroney’s heartfelt arrangement is one of the best I’ve ever heard. A beautiful ending to a fantastic album! 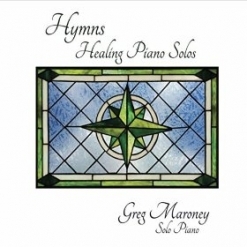 Longtime fans of Greg Maroney’s music will love Coming Home! If you are new to his music, this is a great place to start. 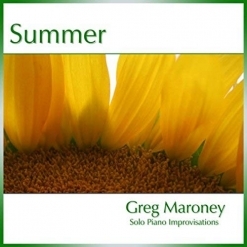 It is currently available from gregmaroney.com, Amazon, CD Baby, and iTunes. I give Coming Home my highest recommendation.